We held the FAD event in Milano last Saturday, where a few Italian Fedora contributors gathered to show interested users and wannabe how to participate to various teams of the Fedora Project. In particular, we had Andrea Veri (infrastructure), Robert Mayr (websites), Samuel Iuri (design), Mario Santagiuliana (localization) talking about how their teams work. Moreover, a talk about contributing to the kernel development was held by Federico Vaga and Massimiliano Bugni shown how to handle Fedora respins both for home and office usage. About me, I tried to quickly describe the importance of packaging for the whole distribution, then invited interested parties to gather in another room for a practical session. For this, I restructured an older presentation I gave about packaging, adding more workshop type material from both Tom Callaway and Miroslav Suchy. The resulting practical session lasted well beyond the original schedule of one hour, but I think it was well received, and the few but very interested users asked many questions and raised interesting topics for further discussion. 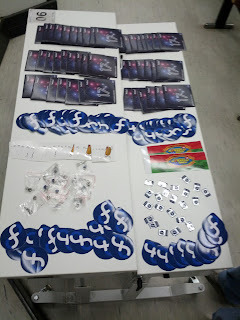 The event run along with the Linux Day, the main FOSS event in Italy held in more than 100 cities. With this arrangement we hoped to gather more participants as a result, but in the end this did not really work as expected. However, I quickly counted about 30 'heads' just before my introduction so in the end I think we see the glass half full and be happy for putting together a great team. I'm sure we will be able to do more wonderful events in the future! PRO: location. Very nice and spacious. 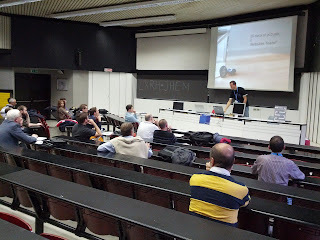 I think it was evaluated for the 2011 FUDCon in Milan but for some reason it did not work. PRO: organization. Marina and Gabriele anticipated every possible need, so the sessions run smoothly. CON: the University have a policy of 'no signs out of bullettin boards'. This made directing the people to the event more difficult than it should be. We could buy some outdoor standing Fedora banners, and use them to direct people in cases like this.